Modern Joshua Tree_Rust! Located in the quiet and coveted Hospital District with amazing boulder views and elevated valley views. Just a short five minute drive to downtown and walking distance to Park trails. Indoor/Outdoor living abounds on this gross 2.5 acre site with large glass openings, sliders, covered outdoor spaces and view corridors everywhere. This home was smartly designed by local vacation rental experts offering great income potential. Tons of high-end amenities are included; standing seam corten roof, tile flooring, built in cabinets, cowboy pool and above ground spa, steam shower, high end appliances, custom aluminum counter tops, LED lighting, custom window coverings, and two private outdoor showers. 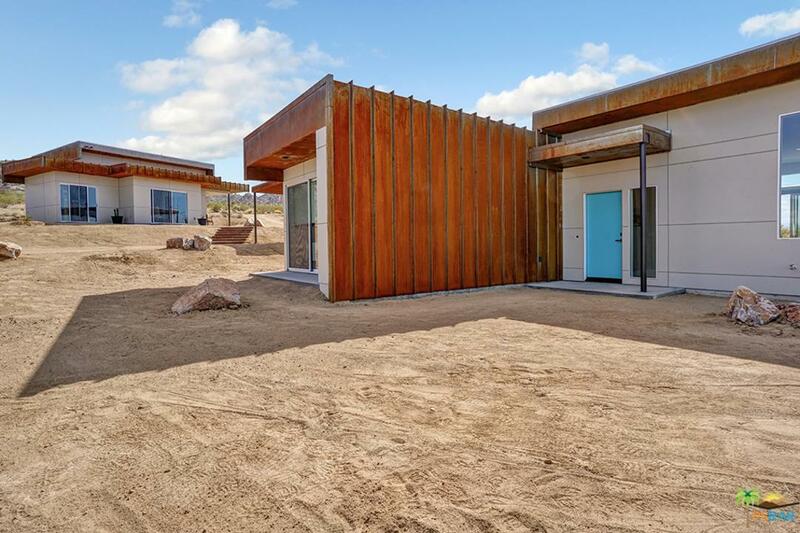 The property also includes a detached casita for your guests with bathroom, bedroom and living area along with an Airstream garage for storage or event space. Enjoy wildlife, Joshua trees, boulder views, privacy, and easy access to the park and downtown. Sold by Team Kud Properties BRE#01882341 of Kud Properties. Listing provided courtesy of Ross Stout DRE#01882341 of Kud Properties and Troy Kudlac CA DRE# 01498474 of Kud Properties.